Washington’s undiscovered reality stars had a chance to be revealed by the queen of reality TV herself: Nicole “Snooki” Polizzi. 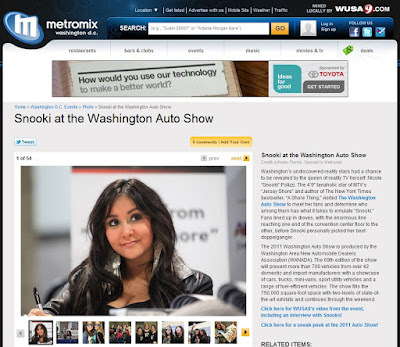 The 4’9” tanaholic star of MTV’s “Jersey Shore” and author of The New York Times bestseller, “A Shore Thing,” visited The Washington Auto Show to meet her fans and determine who among them has what it takes to emulate “Snooki.” Fans lined up in droves, with the enormous line reaching one end of the convention center floor to the other, before Snooki personally picked her best doppelganger. The 2011 Washington Auto Show is produced by the Washington Area New Automobile Dealers Association (WANADA). The 69th edition of the show will present more than 700 vehicles from over 42 domestic and import manufacturers with a showcase of cars, trucks, mini-vans, sport utility vehicles and a range of fuel-efficient vehicles. The show fills the 750,000 square-foot space with two-levels of state-of-the-art exhibits and continues through the weekend.